Remarkable, the first adjective that’s comes to mind that matches the condition of this century genuine Antique Victorian fob locket, most likely English in origin. 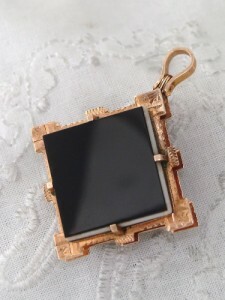 It is double sided so is perfect to enclose small pictures of loved ones to wear close to your heart. The quality construction is obvious. It is so elegant and of classic design and styling. Each side features a different stone – Carnelian and layered black and white Agate – superbly framed by the fancily shaped body with its prong-like claw settings. It is hinged at the top and it is here that the ribbed hanging bail is attached ready to attach a favourite necklace to. Inside houses the original frames/bezels, backing papers and a glass cover. The hinge and clasp are in perfect working order with a stiffness equated to having been used very little. COLOUR It has that silky smooth feel of solid carat gold and to be expected of Quality antique jewellery. It has a warm, rose gold hue so much nicer than the pictures suggest. Near MINT Antique condition! It appears as having had little use – there are no chips/cracks to the stones and no wear, damage, dents or detracting elements – even the prong settings are Immaculate! It is Extraordinarily Beautiful and comes in its original uncleaned condition. If you collect Antique jewellery that you don’t see every day, this is sure to please! You will be thrilled with this one, Guaranteed!